prosperity, was griefstricken when his second wife, Mumtaz Mahal, died during the birth of their daughter Gauhara Begum, their fourteenth child. 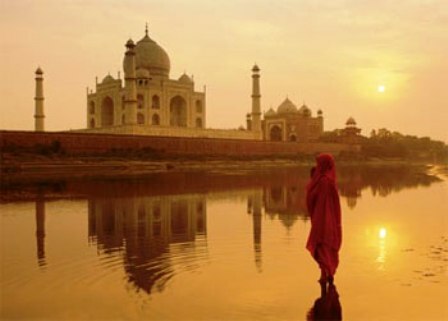 Contemporary court chronicles concerning Shah Jahan’s grief form the basis of the love story traditionally held as the inspiration for the Taj Mahal. 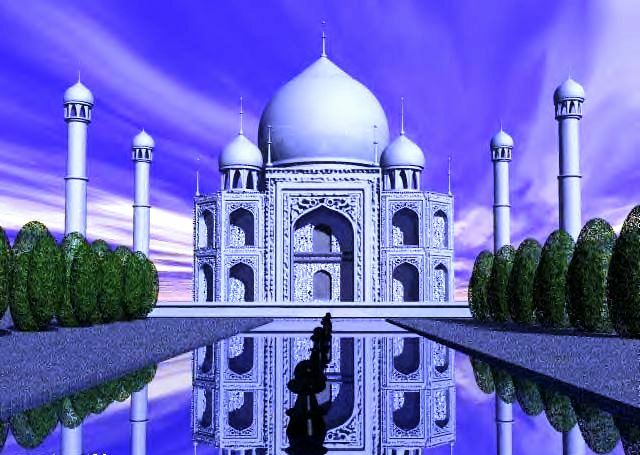 Construction of the Taj Mahal was begun soon after Mumtaz’s death. The principal mausoleum was completed in 1648, and the surrounding buildings and garden were finished five years later. Visiting Agra in 1663, the French traveller FranÃ§ois Bernier wrote the following: I shall finish this letter with a description of the two wonderful mausoleums which constitute the chief superiority of Agra over Delhi . One was erected by Jehan-guyre [sic] in honor of his father Ekbar; and Chah-Jehan raised the other to the memory of his wife Tage Mehale, that extraordinary and celebrated beauty, of whom her husband was so enamoured it is said that he was constant to her during life, and at her death was so affected as nearly to follow her to the grave. The Taj Mahal incorporates and expands on many design traditions, particularly Persian and earlier Mughal architecture. Specific inspiration came from a number of successful Timurid and Mughal buildings. These include the Gur-e Amir (the tomb of Timur, progenitor of the Mughal dynasty, in Samarkand), Humayun’s Tomb, Itmad-Ud-Daulah’s Tomb (sometimes called the Baby Taj), and Shah Jahan’s own Jama Masjid in Delhi. Under his patronage, Mughal building reached new levels of refinement. While previous Mughal building had primarily been constructed of red sandstone, Shah Jahan promoted the use of white marble inlaid with semi-precious stones. The complex is set in and around a large charbagh (a formal Mughal garden divided into four parts). Measuring 300 meters Ã- 300 meters, the garden uses raised pathways which divide each quarter of the garden into 16 sunken parterres or flowerbeds. A raised marble water tank at the center of the garden, halfway between the tomb and the gateway, and a linear reflecting pool on the North-South axis reflect the Taj Mahal. Elsewhere the garden is laid out with avenues of trees and fountains. The charbagh garden was introduced to India by the first Mughal emperor Babur, a design inspired by Persian gardens. The charbagh is meant to reflect the gardens of Paradise (from the Persian paridaeza â€” a walled garden). In mystic Islamic texts of the Mughal period, paradise is described as an ideal garden, filled with abundance. Water plays a key role in these descriptions: In Paradise, these text say, four rivers source at a central spring or mountain, and separate the garden into north, west, south and east. Walkways beside reflecting pool Most Mughal charbaghs are rectangular in form, with a tomb or pavilion in the center of the garden. The Taj Mahal garden is unusual in that the main element, the tomb, is located at the end rather than at the center of the garden. But the existence of the newly discovered Mahtab Bagh or “Moonlight Garden” on the other side of the Yamuna provides a different interpretation â€” that the Yamuna itself was incorporated into the garden’s design, and was meant to be seen as one of the rivers of Paradise. The Taj Mahal complex is bounded by a crenellated red sandstone wall on three sides. The river-facing side is unwalled. Outside the wall are several additional mausoleums, including those of many of Shah Jahan’s other wives, and a larger tomb for Mumtaz’s favorite servant. These structures, composed primarily of red sandstone, are typical of smaller Mughal tombs of the era. On the inner (garden) side, the wall is fronted by columned arcades, a feature typical of Hindu temples later incorporated into Mughal mosques. The wall is interspersed with domed kiosks (chattris), and small buildings which may have been viewing areas or watch towers, such as the so-called Music House, now used as a museum. The main gateway (darwaza) is a monumental structure built primarily of marble. The style is reminiscent of that of Mughal architecture of earlier emperors. Its archways mirror the shape of the tomb’s archways, and its pishtaq arches incorporate the calligraphy that decorates the tomb. It utilises bas-relief and pietra dura (inlaid) decorations with floral motifs. The vaulted ceilings and walls have elaborate geometric designs, like those found in the other sandstone buildings of the complex. Posted by Farzana Naina in Ghazal, Urdu.